Make sure you only pick the good cars instead of bad ones by looking into their past. Use the Kansas free license plate lookup to reveal free vehicle history. The Division of Vehicles under the Kansas Department of Revenue can be requested for information about Arkansas cars. Call at 785-296-3621 (option 1 then option 2) or email at kdor_tr@ks.gov for inquiries about titles and registration. For further assistance, visit the Contact Us page. Vehicle registration and titling can be requested through the local county treasurer’s office. Those who failed to register their vehicles within 60 days of the vehicle’s purchase or ownership transfer are penalized. The Kansas Department of Revenue is the license plate provider in the state. The standard serial format of the state’s plate has three letters and three numbers. The agency requires only a single rear plate for each vehicle unit. Additional plates can be requested for lost or stolen plates by filling out the replacement/duplicate form. There are five (5) plate types available for issuance in Kansas. Check each plate selection to see if you qualify. To initiate a plate transfer, the requester must present the latest registration receipt of the vehicle where the license plate is originally displayed. Within about two months of the plate’s removal, the vehicle where the plate previously belonged to should be sold to or traded with someone else. Complete your plate transfer by submitting the requirements listed by the Division of Motor Vehicles to any county treasurer’s office within the state. A title application for a used vehicle can be done at a state county treasurer branch within two months of becoming the new owner. If a used car were acquired from a private sale, the seller may need to provide a signed copy of the Power of Attorney to the buyer(s). This paper will allow the buyer(s) to title the vehicle as the new owner(s). If a certain vehicle has more than one owner, it must be indicated with a conjunction “OR” if it requires only one signature from any owners. Add “AND” or do not add any conjunction if all owners must provide their signatures. Lost or damaged titles can be replaced by submitting the request form. If a lien has been identified on a used car, the applicant must provide the lienholder’s written consent for its release. Vehicles with an out-of-state title, or were purchased as “used vehicle” outside of Kansas, must undergo vehicle inspection at a certified state inspection station. Upon completion, a car examination paper (or MVE-1) will be issued. You will need the pink copy of the paper to get a Kansas vehicle title. Visit the “Titling a used vehicle with a paper title” page for more details about paper titling. If you want a more convenient approach to handling your title and lien, you may try the state’s Electronic Liens and Title System. A more secure, faster, and cheaper platform in doing title-related transactions. Buying a used car in Kansas? Don’t make a costly mistake. 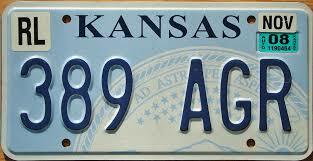 Run a Free License Plate Lookup for your Kansas-registered vehicle! Run a Free Kansas License Plate Lookup to uncover the full-story of your Kansas-registered vehicle.